The Israel Defense Industry has experienced dwindling exports since 2012 due to greater international competition leading to increased foreign defense spending and domestic defense spending cuts. Defense industry leaders presented a letter to Prime Minister Netanyahu in November 2015, in which they stated that they are in a “clear crisis,” and defense exports would only amount to $4 - 4.5 billion in 2015. Israeli defense exports totalled $7.5 billion in 2012, and subsequently dropped to $6.5 billion in 2013 and $5.5 billion in 2014. In 2016 Israeli defense exports grew to $6.5 billion, representing an $800 million increase over the previous year and the largest export numbers since 2013. 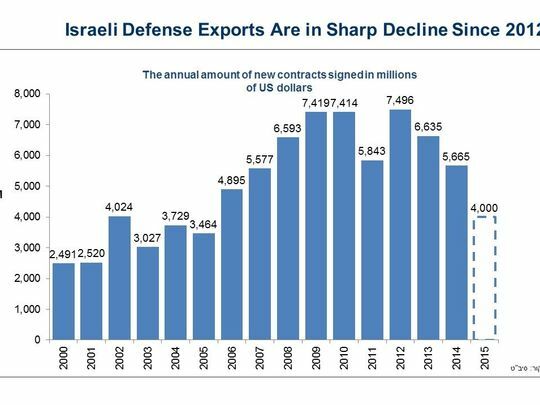 Israeli defense exports have experienced a steady decline since 2012. During the 1973 Yom Kippur War, Israeli armor suffered heavy losses from Egyptian and Syrian wire-guided anti-tank missiles. The high casualty rate spurred the IDF, which had previously depended on US-made Patton and Sherman tanks and British Centurion tanks, to develop the Merkava (Heb., chariot), considered one of the world's most effective and safest battle tanks. Development of the Merkava was headed by Gen. Israel Tal, a former Armored Corps commander. Tal's team sought to design a tank that provided maximum protection to the tanks crew. One element of that defense is the placement of the tank's engine at the front of the vehicle, where it serves as a shield for the personnel compartment. This in turn provided more space in the vehicle's rear, which can be used to carry up to six extra soldiers. In addition, a special "canopy" protects the commander from indirect fire; the turret and the hull are fitted with a modular armor system that can be changed in the field; and the forward section of the turret is fitted with additional blocks of armor that provide extra protection against the latest generation of anti-tank missiles. A "skirt" of chains with ball weights is attached to the lower half of the turret, causing incoming projectiles to detonate on impact with the chains instead of penetrating the turret ring. The tank became operative in 1979, and was first employed in the 1982 Operation "Peace for Galilee". The Mark I model was succeeded by the Mark II in 1983, which was replaced by the Mark III in 1990. Among the features of the Mark III are a new suspension system, a 1200-horsepower engine and new transmission, a more powerful main gun, and ballistic protection provided by special armor modules. The main 120-mm gun, developed by Israel Military Industries, is enclosed in a thermal sleeve that increases accuracy by preventing heat distortion. Mark II and Mark III tanks are currently in service in the IDF; a Mark IV model, with additional safety and fire-control features, is currently being developed. It will include a new compressed-gas recoil system and thermal sleeve for the 120-mm gun, to enable the firing of enhanced kinetic energy ammunition. With the exception of the engine, all systems and assemblies of the Merkava tanks are of Israeli design and manufacture.